Much like bees, dung beetles have a habit of shaking their groove thangs while undertaking that important task of rolling around balls of poop. When they form the ball, they crawl on top of it, and "rotate around their vertical axis". By analyzing their habits, researchers have discovered that this seems to be how the beetles orient themselves. Since the dungpile itself is a hotbed of competition from others of their species, the beetles quickly form the ball, and push it in a straight line as fast as possible out of there. The researchers have surmised that the dance is an orientation mechanism, which the insect uses to align itself with celestial bodies. They'll also do the same thing if they lose control of the ball, or hit some particularly rough terrain, in order to regain their initial bearing. As incredibly cool of a look as this is into how a species navigates and maintains unerring direction in previously untravelled territory, it's interesting to note that this research is at least partly funded by the Air Force. That's right, it was funded by the United States Air Force Office of Scientific Research (grant no. FA8655-07-C-4011), officially titled "Nocturnal Visual Orientation in Flying Insects: A Benchmark for the Design of Vision-based Sensors in Micro-Aerial Vehicles". 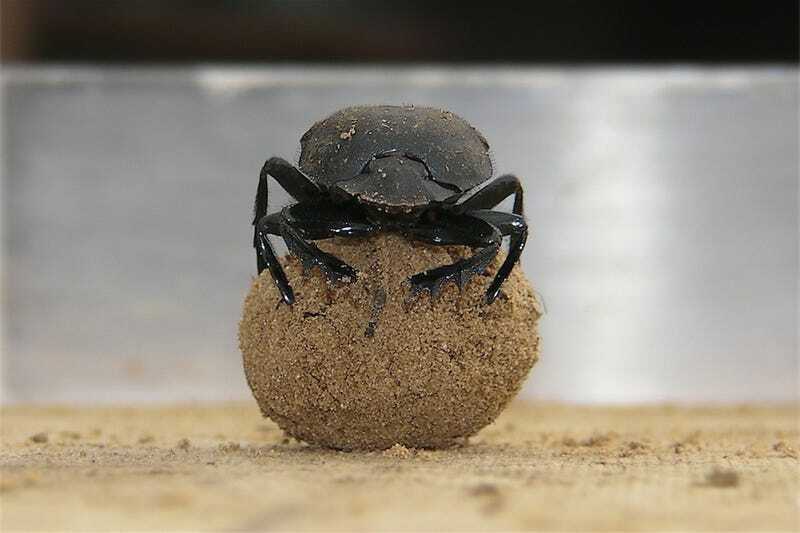 While it may seem completely bizarre to have the military paying for research into dung beetles, the funding is for researching how insects navigate, including their use of celestial bodies, and so this paper totally fits the bill.